Thea of Thea & Sami recently sent me a swatch of the linen she uses to screen print her fresh, modern designs onto. Obviously the linen is excellent quality and is now available for purchase in the Thea & Sami online store! Service: Excellent, Thea is lovely to deal with. 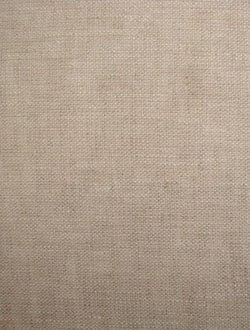 Rating: This linen is 260gsm, it's very high quality and quite soft compared to other linen of the same weight. The site gives a very informative description of the linen manufacturing process and its environmental benefits. Because this is the linen used for their printed fabric, it coordinates perfectly with Thea & Sami designs. I would personally use this linen for embroidery projects, the colour is the perfect shade for my lavender birds, embroidered pouches and notebook covers. Because it is quite soft I would also use it for my smaller softies like bunny. 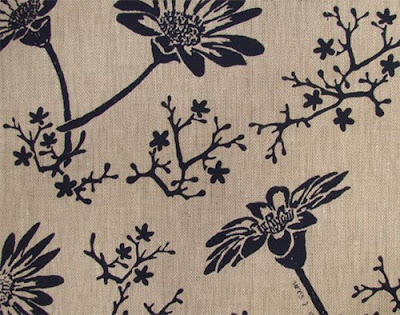 Thea and Sami also have a range of organic and eco fabrics worth checking out as well as their gorgeous range of printed fabrics like Marguerite - Navy on Natural below. Would I buy it again? Yes, especially as Thea is Brisbane based. Have you purchased linen recently? Would you like to be a guest blogger for The Linen Quest? Leave me a comment with your details or contact me directly via the email contact in my sidebar to take part! Your linen quest is very informative, since purchasing online is great but with fabric I normally like to feel it...Thanks. What about the colour is the photo reflecting colour well? The colour is slightly lighter than it is on my screen but you know how it is with computer screens, everyone's is different so unless it's callibrated correctly it won't look exactly the same. I'll do a post soon that will compare the linen colours a little better which may help. Er, I'm eavesdropping in on this conversation - I'm looking forward to the Linen Colour Comparison too! This is a top topic - I've been looking for good linen for a while and you're doing all the grunt work for me! Hooray! Thanks for blogging about this Rebecca. A note to people who like to see and feel first(and who doesn't? ): you can order fabric swatches through our on-line store. Cost of swatches are always deducted from future fabric purchases. Thanks Thea, it's so great that you do this especially deducting the cost of the swatch! If only more online fabric stores were so thoughtful. If you dont mind expensive fabrics you should try hemptech. Its based in NZ but has a victorian agent. They have a great range of linens that you would love, its just their prices are quite high (80+). Just bought some of the Thea and Sami unbleached linen for embroidery - lovely and thick and a gorgeous sheen to it. Thanks for the comparisons! That's great Lisa, it really is lovely and you're right about the sheen, I haven't come across another linen yet that has that lovely texture.